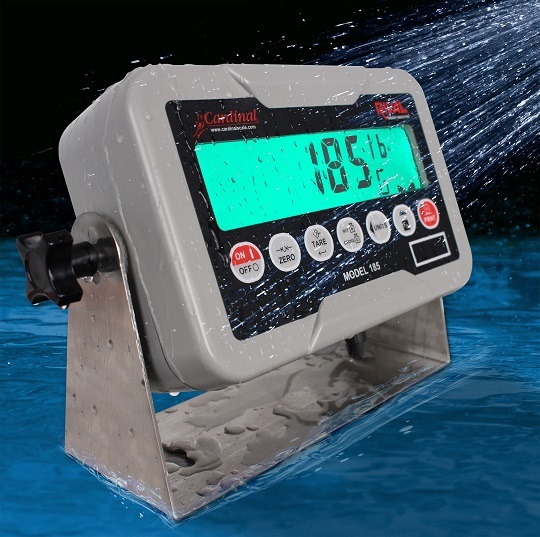 Cardinal Scale’s new 185 Rival is a durable weight indicator with bright-green LCD for easy viewing. The washdown IP66-rated attractive molded ABS enclosure is built for durability in harsh indoor or outdoor weighing applications. Also available with rechargeable battery power, the model 185B is powered by six standard, off-the-shelf AA Alkaline or rechargeable Ni-Cad or NiMH batteries. Internal battery circuitry automatically detects the battery type for charging. The 185 Rival may be used as a remote display for long-range viewing when connected to another weight display. The 1-in.-high bold green LCD is visible from a distance. The 185 indicator comes with a versatile stainless steel swivel mounting bracket for desktop or wall-mount set up. The anti-slip mounting bracket includes rotational lock-in set points adjustable in discrete 15º increments for exact positioning of the display right where you want it. It features RS232 serial output with waterproof gland connectors for connectivity with a PC or printer. The watertight power connector meets washdown requirements.